48 SMT Magazine • January 2015 Mil/Aero007 News Highlights 48 SMT Magazine • January 2015 Colognori Joins Zentech's Mil/Aero, Space Market Initiative Zentech Manufacturing is pleased to announce that Jay Colognori has joined the team as director, Business Development, Mil/Aero and Space Mar- kets. 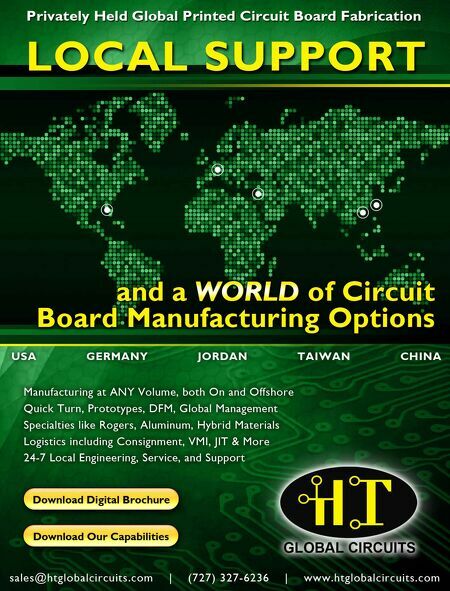 He is widely respected in the Mid-Atlantic market and beyond for driving innovative engi- neering solutions to solve the most challenging of printed circuit board requirements. Kitron Nets Order from Offshore/ Marine Sector "Kitron has experienced a reduced order backlog within the Offshore/Marine sector during 2014, which makes this order important in order to secure volume going into 2015," said Peter Nilsson, CEO. Orbit Electronics' New Orders in November Top $1.4M Orbit International Corporation, an EMS and soft- ware solution provider, announces its Electronics Group received new and follow-on orders for its products on several programs in the month of No- vember totaling over $1,400,000. API Wins $3M Order for Secure Communication Products API Technologies Corporation has received a new $3 million order from a Fortune 50 company to produce secure communications products that will be used to support a U.S. C4ISR program. Vintage Nominates Directors to IEC's Board Vintage Capital Management, LLC has filed pre- liminary proxy materials with the Securities and Exchange Commission for the election of seven directors to IEC's Board of Directors at its 2015 An- nual Meeting of Stockholders. BAE Systems to Buy Eclipse Electronic Systems BAE Systems has entered into an agreement with Esterline Corporation for the proposed acquisition of its wholly-owned subsidiary, Eclipse Electronic Systems, Inc., for cash consideration of approxi- mately $28 million, subject to closing adjustments. Weapon Purchase by India Raises Questions Questions hang heavy in the air about India re- lations with its traditional military suppliers such as Palestine, Russia, and the U.S. as the country inches closer to buy more and more military hard- ware from Israel. 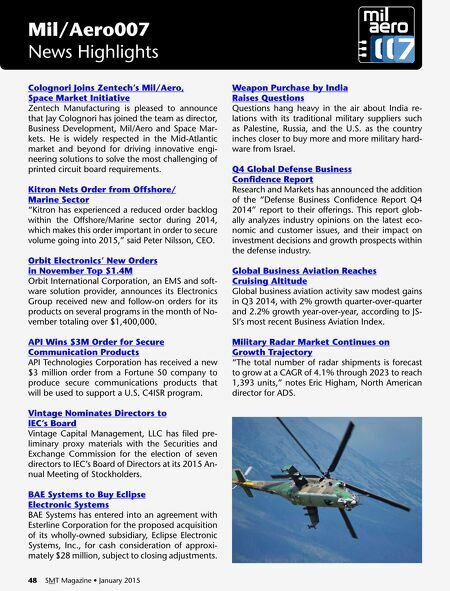 Q4 Global Defense Business Confidence Report Research and Markets has announced the addition of the "Defense Business Confidence Report Q4 2014" report to their offerings. This report glob- ally analyzes industry opinions on the latest eco- nomic and customer issues, and their impact on investment decisions and growth prospects within the defense industry. Global Business Aviation Reaches Cruising Altitude Global business aviation activity saw modest gains in Q3 2014, with 2% growth quarter-over-quarter and 2.2% growth year-over-year, according to JS- SI's most recent Business Aviation Index. Military Radar Market Continues on Growth Trajectory "The total number of radar shipments is forecast to grow at a CAGR of 4.1% through 2023 to reach 1,393 units," notes Eric Higham, North American director for ADS. Video Interview — HKPCA has Become One of the Largest Shows in the Industry!